Wildlife veterinarians have been responding to an unexplained "die-off" of Northern Gannets on Massachusetts' South Shore and Cape Cod. Gannets are washing up on local beaches, seriously ill, or already dead. Scientists are stumped over what can be causing the illness. 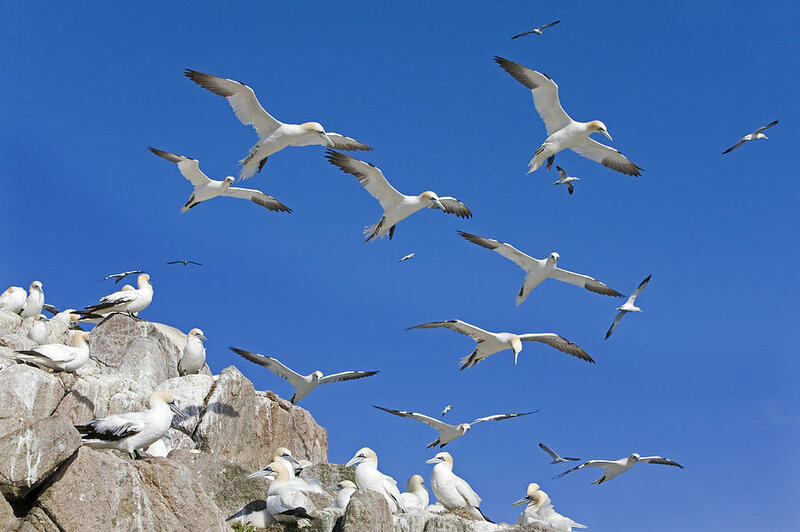 A wildlife technician with the U.S. Department of Agriculture estimates about 100 northern gannets have been affected overall. The New England Wildlife Center (NEWC) has been scrambling to figure out the mystery. NEWC trying to quickly pinpoint the cause because it "is critical to protecting the fragile eco-system on Cape Cod," explained Dr. Greg Mertz, veterinarian and CEO of NEWC on the NEWC website. Staff at the Wild Care center in Eastham says 16 of the 21 gannets brought to the facility have died from the ailment. Necropsies on the birds have so far been inconclusive. The Cape Cod Times reports that local animal hospitals and rehabilitation centers have seen an increase in gannets at their facilities over the past few months. The risk of the disease spreading to other species of birds is a major concern. Local and state organizations are continuing to investigate. With wingspans reaching up to six feet, gannets are known for diving through the water from nearly 130 feet in the air. Officials say the deaths are not going to impact the bird's population.